Date of Birth: July 10, 2000 a.t.b. Lelouch's childhood friend and son of Japan's last prime minister. After Britannia's takeover of Japan, Suzaku joins the Britannia Army and becomes an Honorary Britannian. 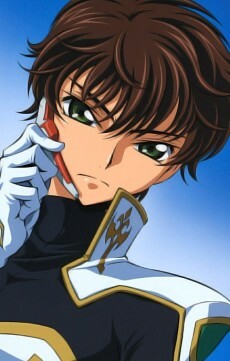 He agrees with Zero (Lelouch in disguise, unknown to Suzaku) with his assertion that the Britannia Empire is not worth serving, but nevertheless wishes to implement changes and improvements from within the empire, all the while trying not to lose sight of his goals lest his father's death have been in vain. He has a strong sense of justice and is the only one known to be able to pilot the elite Britannian Knightmare Frame, Lancelot. He always keeps with him a broken pocket watch, a memento of his deceased father. He is in love with Euphemia and is devastated upon her death. He swears revenge against Zero, for killing her. In the last episode of R2, Lelouch asks Suzaku to kill him (as all of the world's hatred is now focused upon him) and to become Zero. Suzaku kills Lelouch in front of all the Black Knights and Nunnally at a parade held for Lelouch. After Lelouch dies, Suzaku takes care of Nunnally as Zero and leads the Black Knights.